The top-of-the-line in American Flags for sale for the true flag enthusiast. These high-quality American Flags feature fast nylon material for great durability and all weather color. Extra large and densely embroidered stars create a beautiful flag. The Signature Series large American flags have hand-sewn stripes featuring four-rows of LOCK STITCHING on the fly end. 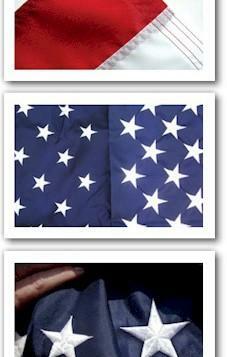 These American-made American flags are finished with canvas header and brass grommets.